It’s September, the leaves are starting to fall and autumn is in the air. Our brand new theme Organic sets the right mood for this season with earthy colors and impressive parallax background images. It combines a modern fresh look with a classic boxed layout, making Organic the perfect base for any kind of travel, blog or other service based site. The large header gives the background parallax effect the space it need to give your site a unique look. 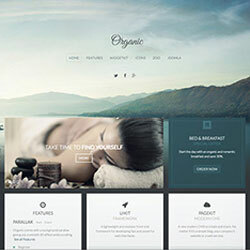 Organic comes with a range of different layout and style variations. As always you can choose between different light and dark styles. Explore many lovingly designed details and technological features like the background parallax effect, beautiful overlays for your images and fresh typography. In addition Organic features a bonus style for the Widgetkit Slideshow, which perfectly fits the theme's design. Organic is based on Warp 7 and provides full support for LESS. The front-end is completely built with UIkit and can be modified through the Customizer. You can change colors, spacings and fonts without having to write a single line of code. To get you started, Organic already provides 6 different style variations to choose from.